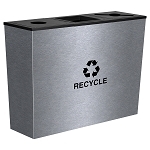 Trashcans Warehouse offers a vast selection of metal waste containers, including stainless steel recycling bins, trash cans and waste receptacles. 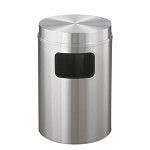 Heavy-gauge stainless steel waste containers are an attractive addition to any corporate setting. Choose from a variety of stylish shapes and sizes, including traditional stainless steel and powder-coated steel. The durability of all our steel containers is unmatched, whether for indoor or outdoor use. 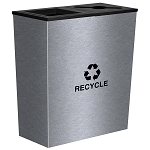 Stainless Steel recycling bins and trash containers can brighten up any office or corporate environment. 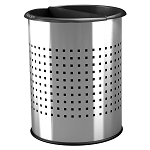 Our selection of stainless bins come in many shapes, sizes and streams. Recommended for indoor use, our collection of classic and contemporary containers are great for bathrooms, lobbies, hotel gyms, near elevators and anywhere a shiny, cheerful trash receptacle is needed to complement the decor. 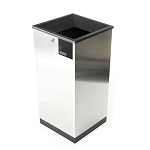 Our stainless steel trash bins resist corrosion and stains. Considered a lower-maintenance solution, the familiar lustre make our containers an ideal choice for many applications. This sturdy metal alloy is often used for surgical instruments, appliances and, industrial equipment thanks to its strength and long-lasting qualities. 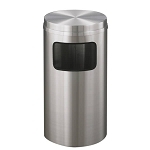 Our customers also find stainless waste barrels a stellar choice for commercial kitchens, food processing areas, operating and recovery rooms, healthcare and hospital environments, since sanitizing and cleaning this unique metal tends to be easier and more effective than its plastic counterparts. In addition to our standard individual stainless units, several models are also available in two-stream and three-stream configurations. Echelon and Hex products are an undiscovered gem in our store. 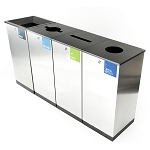 With flexible label choices included, you’ll look like a superstar recycler showcasing these modern and handsome steel outdoor trash cans in your school, university or office. Looking for a classic 1950’s Diner style trash can? Our dome-top, push-top and swing-top stainless models will look super in your restaurant or cafeteria. 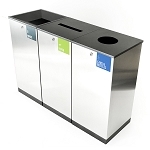 A newer addition to our catalog, the Boka Series of waste and recycling bins is a favorite of international airports and local transit centers. 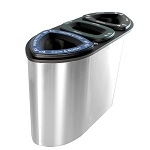 These stainless steel recycling bins and waste cans have a distinctive shape with large openings and labels that encourage users to sort trash and recycling. 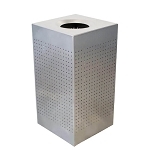 Popular choices within our stainless steel collection for clients in the sports franchise, stadiums, fitness centers, team sports and similar athletic organizations are tough steel outdoor trash cans, Perforated receptacles, Venue Stations and the Polished Metal units. Hard plastic lids with wide openings make tossing away refuse a snap in busy, crowded environments. Back-of-house workers enjoy ease-of-use found in the Modern Drop-Top rectangular products with a signature style and no-muss, no-fuss design. 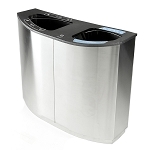 Clean-up is easy and removable tops make these wastebaskets service-friendly. 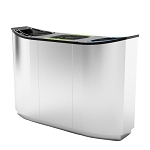 The Flip-top Stainless model shown above has similar action but is better suited for front-of-house usage. 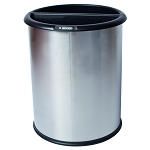 Small stainless steel garbage cans are super in-demand by our hotel and resort buyers. Available in bulk quantities, franchise and chain motel customers can outfit an entire property with one order. If you’re a procurement specialist with any business requiring large quantities of recycle and trash equipment, we have the pail for you! 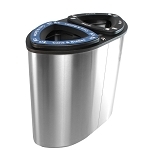 The InnRoom Classic and InnRoom Recycling/Waste cans, along with our Executive Waste baskets are hugely popular items. Also look for these garbage pails in classic brown and black colors. 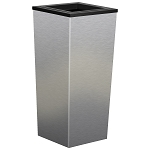 At Trashcans Warehouse, our mission is to help customers find the best trashcans for their particular organization, in stainless-steel or otherwise. We take pride in our products and amazing Customer Service and Sales teams. If you’ve done business with the competition, you’ll be pleasantly surprised at our commitment to excellence and customer satisfaction. We are here to help. 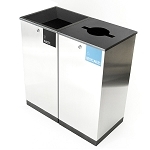 You will find our trashcans at the most respected public and private companies, educational institutions and religious organizations in the United States and Canada. Our experts can help keep your campus, grounds and facilities beautiful with the most appropriate refuse and reuse containers available. We would be thrilled to help your team succeed in sustainability!